1/1/12 - Heritage - Versailles, Musée et domaine national du château - In 2011, Jean-Jacques Aillagon, the president of the Etablissement public de Versailles, had supported  the installation of the Roland-Garros tennis tournament on the property of the Matelots and the Mortemets, which had been promised to the Public Establishment of Versailles (see article in French). 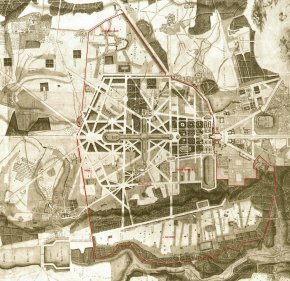 This project, besides containing two 31 m. high-stadiums, larger than the Bercy Palais omnisport, also included "complementary programs [...] enhanced by the Etablissement public de Saclay [...] of hotel and tourist accomodations [...] and businesses", a program rounded out by a "medical or health and fitness center", a few dozen meters from the Grand Canal . A few days before leaving for retirement, the last decision which the same Jean-Jacques Aillagon  imposed was the construction of dozens of units of low-income housing in Chèvreloup, thus creating a highly dangerous precedent for the rest of the Domain and the Versailles Plain (see article in French). according to Joseph de Villanez, around 1735. "I am writing these lines on 2 October  in the morning. I turned sixty-five a few hours ago. Having been invited to apply for my retirement rights, I [would like to express] my best wishes to Catherine Pégard [...]. I would also add some recommendations to these wishes, while being aware that we can no longer dispose of a time which is not ours now. Louis XIV’s spirit experienced it himself. After dying on 1st September 1715, the great king, to whom I would not presume a comparison, had his will changed a few days later. However, [...] let us try to imagine what Versailles might look like a few years from now. The effort to reconstruct the royal domain of Versailles will have continued steadfastly, of which some areas in 2011 were still assigned to other institutions, the potager du Roi (or king’s vegetable garden) to the Ministry of Agriculture, the Matelots property  to the Ministry of Defense, the domain of Chèvreloup to the Museum of Natural History. The "Grand Versailles" will then reunite, within the same space, the vast territory which extends from the Satory hills to the Marly domain. The geographical continuity of the domain will have been reestablished in those places interrupted by unwanted roads, such as the route départemental 10 which separated the château’s gardens from its southern area, the potager du Roi, the Suisses pond, the Mortemets and the Matelot. A section of this route will pass underground so that the landscape seen from the Queen’s apartments recovers its unspoiled view and visitors may walk from the Orangerie to the Satory hills without encountering a single car. [...] The government’s attention to the protection of the landscape around Versailles will be faultless. Any projects for new installations or arrangements not sufficiently considerate of the delicate condition of this designed nature which, since Louis XIV, corresponds to the Versailles Plain will have been vigorously and bravely eliminated. " . Consequently, Jean-Jacques Aillagon is recommending the opposite of what he practiced during his presidency, strange as it may seem . We now consider ourselves fortunate to count among us a new opponent to the policies planned by the mayor of Versailles who wishes to urbanize several areas of the park , among which the ones now defended by Jean-Jacques Aillagon. We can only hope that Catherine Pégard, the new president of the Public establishment of Versailles, will vigorously oppose the trends initiated by her predecessor, Jean-Jacques Aillagon, and will follow the recommendations of the former president, Aillagon Jean-Jacques. Former website of Versailles Roland-Garros (no longer online), heading "Questions/answers", question 5. 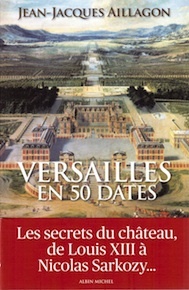 Jean-Jacques Aillagon, Versailles en 50 dates, Paris, Albin Michel, Nov. 2011, pp. 319-320. On 9 February 2011, Jean-Jacques Aillagon in fact wrote in his blog, in response to our article of 2 February : "I know very well that one might, theoretically, dream of solutions for this vast site which would be in fact the pure and simple reconstitution of the landscaped structure in this part of the historical domain of Versailles. I fear, however, that given the circumstances, it would be impossible for us to achieve this goal in the foreseeable future. My task is thus to choose the best of the remaining solutions. That of bringing Roland-Garros to Versailles seems to me, in this light, worthy of our support. It may provide the château of Versailles with the possibiity of saving a very fragile part of its vast domain from what has been a long period of neglect." We received a short response from City Hall to our article, which we will publish in a few days.